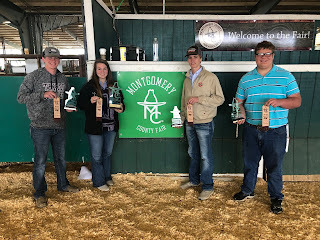 On Wednesday, Shane Hlavinka, JR Schauer, Colby Jedlicka, and Sydnie Lackey attended the Montgomery County Livestock Judging Contest. The team had an excellent day with Shane placing 4th as an individual, JR 6th, Colby 10th, and as a team placing 1st. EB FFA members will be competing at Area CDE Contests today at Blinn, tomorrow at TAMU, and April 16 at SHSU. Yesterday, we attended the Gulf Coast District Public Speaking Contest and Convention in El Campo. Julie David completed an exam, interview, and gave a speech to the district. She was elected as a 2019-2020 District Vice President. Ralston Chumchal finished out his year as a 2018-2019 District Vice President and did a great job at assisting in running the convention. As a group, the speakers took home the Sweepstakes Award as well. Congratulations to these members, the advancing speakers will compete at the Area XI Public Speaking Contest on May 16.